You hear a lot of complaining about how people drive all around the world and here in Malta its quite a normality to hear such complaints, but surely I guess one of the reasons is that a lot of drivers just dont care or do not want to care. One big issue has always been indicators. All you need to do is get a comfortable chair, sit in the shade near a round about and start counting. You will be better off counting the ones that actually use their indicators then actually those who do not as surely they will be fewer! 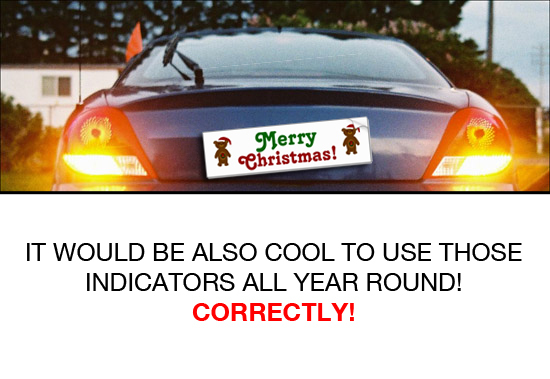 I guess Transport Malta should use some of their marketing budget to educate drivers in Malta, maybe in a funny way like proposed below and hope (or pray) that it will make an effect and indicators start being used as they are supposed to be used rather than an additional decor to the car or to light up for Christmas!